VILLAS AND APARTMENTS TO RENT IN CALONGE, SPAIN. 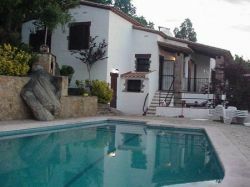 Welcome to our selection of holiday homes to rent in Calonge, Spain. Sunny Spain is like no other country, as you are guaranteed a great time on a trip here. Calonge is no exception with the many things for the visitor to see and do on a trip here. The surrounding areas too have a lot to offer the visitor. Enjoy the beautiful beach where you can unwind and relax, while you soak in the sun or go for a dip in the blue waters. You will find a host of sport facilities here that will make it harder to leave the beach! And when you do, there is a medieval castle close by that you can visit. The town dates back to the 12th century, which is why you will find several ruins and old houses that go back a long time. There is also an old lighthouse that is still in working condition and was a source of comfort for weary sailors and, who knows, perhaps some pirates too! You can also take in a small history museum while here. Close to Calonge is the Girona Cathedral, which was a Romanesque structure initially. It was redesigned in 1312 and was converted to a gothic design with the second largest nave in the world at 22.98m. Well worth your time to see and appreciate this historic structure. The city walls are great places to walk and get a wonderful view of the town below, as well as of the surrounding mountains. You can also climb the many towers to get a higher elevation for a spectacular view of the surroundings. It is definitely a must do while here. You can visit this beautiful coastal town, which used to be a fishing village not so long ago. This is a very upmarket area with some great eating-places. The beach is a great place to enjoy the sun, sand and sea. A little away from the sea are some good campsites. The beaches here are all blue flag standard. Enjoy a trip to the past with a visit to the Lloret de Mar Castle. It is quite an imposing structure and lends a regal air to the place. The surroundings add to the picture postcard feeling you get when seeing it for the first time. Well worth a visit. A visit here is an opportunity to relax, soak in the sun and learn of the glorious past of the region. Looking for self catering holiday accommodation in Calonge? Then below is a selection of holiday apartments in Calonge and holiday villas in Calonge that can be rented direct from their owners. You can either click on each listing for further details or you can use our search engine on the left if you are looking for something in particular.